The various kinds of hieratic inscriptions, or dockets, which the ancient reburial party scribes left on the mummies, their coffins, and, sometimes, the walls of certain sepulchers, help add important details to the story of the cache tombs. By examining them closely, especially in context with other physical evidence found in the tombs (such as the placement and condition of burials within the caches) a chronology of the funerary activity that took place within DB320, KV35, and much of the Valley of the Kings can be worked out. Up until ten years ago, the dockets had never been systematically studied in detail, and had not been completely published in a single work that could be used for serious research purposes. Elizabeth Thomas's Royal Necropolis of Thebes (1966) and Kenneth Kitchen's The Third Intermediate Period (1973) provided the best sources for docket data, but did not include all the dockets. This situation changed in 1990, when C. N. Reeves published Valley of the Kings: the Decline of a Royal Necropolis (abbreviated as DRN on this website.) This monumental study of the Theban royal necropolis undertook nothing less than the complete reconstruction of all burial and post-burial activity that transpired within the the Valley of the Kings and the Dier el-Bahri area during the New Kingdom and early Third Intermediate Period. With a virtuoso display of historical analysis, Reeves succeeded remarkably well in completing this daunting task, and was greatly aided in its completion by a detailed examination of the dockets, most of which were published in Chapter 11 of DRN. Reeves developed a simple method of classifying dockets which I use on this website. On his tables of dockets, Reeves also lists two other types of docket: graffiti inscriptions (G) found on locations in the Theban necropolis which make them especially relevant to the subject of post interment activity; and linen notations (LN) which give (i.) the name of the person who had originally donated the linens thus indicated for use in the temple rituals pertaining to a deity, and (ii.) the date when the linens were made and/or donated. These dockets are especially interesting because they provide evidence of the Egyptian custom of using temple linens for later mummification purposes, and also help to give an approximate date for the death of the person on whose wrappings they appear. Reeves further distinguishes dockets into two types: type A and type B. A type A docket merely records the name, and often the titles, of the deceased person. Reeves states that these dockets had a clear and simple purpose as identification aids, and were placed prominently on on the coffin lids and/or wrappings of the mummies so identified. Based on a study of Gaston Maspero's facsimiles of type A dockets from DB320, Reeves was able to use similarities in ancient handwriting styles to make some conclusions concerning the dates of various reburials and the mummies that had been grouped together in earlier cache tombs. He notes that similar type A dockets from the KV35 cache were never documented properly. Type B dockets are more interesting and informative because they contain a record of the actions undertaken with respect to specific mummies. They provide the mummy's post interment "itinerary," to borrow Reeves' happy choice of words, and an understanding of these dockets enabled him to generate a chronology for post-interment activity in the Theban royal necropolis. 2. krs--"burial," in the sense of a complete Egyptian burial, with coffins, canopics, rituals, etc. 4. whm sm3--"repetition of interment," a term which Reeves explains was used only once on the mummy of Tuthmosis II, perhaps in connection with a possible reburial of this king in the tomb of Amenhotep I. 5. rdit wsir--"osirification," a term for which the precise definition remains uncertain. Reeves points out that it appears on only four mummies in the DB320 cache (those of Ramesses III, Ahmose-Sitkamose, Amosis I, and Siamun.) He interprets it as an allusion to the myth in which Isis gathers the scattered portions of the body of Osiris and gives them to Anubis for mummification. This might at first lead one to assume that the term, when used in the cache dockets, implies that the mummy so docketed had been broken to pieces by thieves and then restored to its former order by the reburial party. But Reeves notes that rdit wsir was used on the docket attached to the mummy of Ramesses III, which had not been damaged significantly by thieves. He also notes that the term was also applied to the mummy of Siamun, which had not been restored to any kind of order by the reburial party. Reeves tentatively concludes that rdit wsir refers to some type of status-change undergone by a mummy whenever it was removed from its original tomb and reburied elsewhere. How Reliable Are The Dockets? Soon after the mummies and coffins from DB 320 were shipped to Cairo and examined, it became apparent that the ancient restorers had sometimes gotten confused, and placed some mummies in coffins that had not originally belonged to them. The cached group of mummies from KV 35 exhibited similar signs of confusion regarding mummies and their coffins. These mix-ups produced a generalized doubt regarding the accuracy of all the dockets, one which Reeves feels is over-reactive. He agrees with Herbert Winlock's dicta that the ancient dockets should be accepted as accurate unless there is very good reason to doubt them, and points out that none of the docket identifications of mummies have ever been conclusively proven false. Reeves also notes that the presence of undocketed, unidentified mummies in the caches indicates that the ancient restorers would not docket a mummy about whose identity they were uncertain. Another possibility which Reeves doesn't consider revolves around the question of the literacy level of the people who actually placed the mummies in the coffins after they had undergone "osirification" (rdit wsir) or "repetition of burial" (whm sm3.) Levels of literacy in ancient Egypt were always low, and it is highly possible that not everyone employed in the caching of the royal mummies could read. We know from examining tombs in the Valley of the Kings that they were constructed by gangs of workers, each gang performing a highly specialized task. A similarly specialized approach was probably used in the preparation of the cached burials. It is easy to see one group of literate priests rewrapping mummies, a group of literate scribes writing out the dockets, another group removing the gold surfaces from coffins, and a fourth group of simple laborers doing the actual "dirty work" of placing mummies in coffins and transporting them to the cache tombs. If these laborers were illiterate, they would have been given verbal instructions concerning the coffins in which to place the mummies. Without constant supervision by the priests and scribes, mistakes would inevitably occur. In the case of DB 320, the lay-out of the tomb and the size and weight of many of the coffins may have forced the workers to remove mummies from their coffins in order to facilitate the process of moving these sometimes colossal objects into place. If this occurred, the mummies would have been replaced in coffins at the actual tomb site in a process that would have given another opportunity for confusion to occur. No contradictions between linen dockets appearing on the shrouds or wrappings of the mummies themselves have been found. The only discrepancies occur between linen dockets and coffin inscriptions. This is easily explained if we postulate several different groups of workers, some of whom could not read or write. This also resolves the problem of mummy identification altogether because the confusion found in the cache tombs is actually a confusion regarding the owners of coffins, not the identity of mummies. The whole line of reasoning which contends that linen docket identifications on mummies are unreliable because the names on their coffins sometimes fail to correspond with them is based on a fallacy. 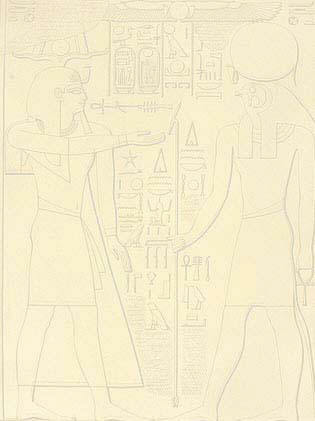 Throughout this website, Reeves' reconstruction of post-interment activity in and around the Valley of the Kings is taken as accurate, and his assumptions regarding the accuracy of the dockets are accepted as valid.